A follower of this blog sent me a very intriguing email with an article from one of the most widely quoted socio/urban planners in the U.S. by the name of Richard Florida. It happens to include an interactive map that allows you to zoom down to any county in the entire country for some very specific economic indicators. 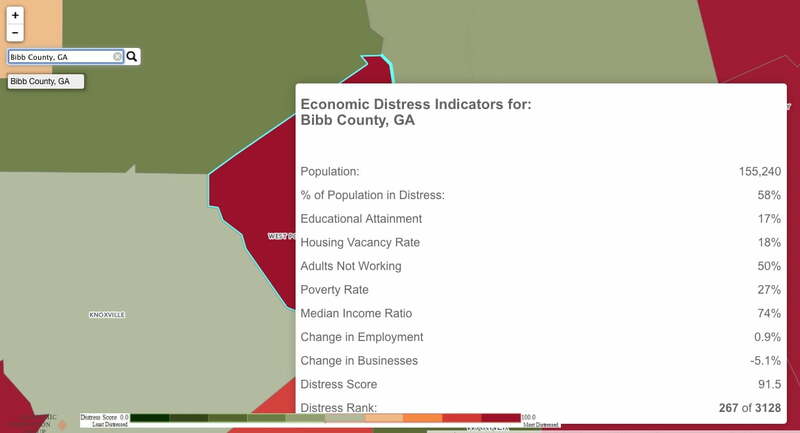 I have taken the liberty of posting a snapshot of Bibb County which is the county that encompasses Macon, GA. Please note that you can zoom down even further by entering zip codes and seeing the same data specific to your zip code. When you first click the link to the interactive map you will see the entire country. Areas of green are doing substantially better than the areas of the map colored in darker shades of burnt orange. This map is an eye opener when you can visualize the areas of desperate poverty which are to a large degree focused in the deep South. In addition to this email I also received a second email from someone else coincidentally that addressed this very same concern about the direction of Bibb County. I will not disclose their name since this was presumably sent only as a comment to me privately and I do not not want to publish their name without their explicit approval. However, their comment was very salient and I thought it worth sharing within this article. Thank you for your logic on Macon’s predicament. Mayor Reicher has not helped, by endorsing every new tax on the table. Today my garbage bill is double, and splosts have reduced my living standards; appraisals are out of line with reality, forest hill is destroyed, and now a truck stop will be approved on in South Bibb. I truly believe this administration has been duped by the chamber of commerce. Residents are just a pain In their necks and no longer wanted. The middle class that can are moving just outside the county lines and so business follows. All that will be left is the very old, students, and the very poor. Now, how does this help Macon? It won’t. The remainder of this article is the report issued by Richard Florida who is the co-founder and editor at large of CityLab and a senior editor at The Atlantic. Despite the economic recovery, the nation’s pattern of concentrated inequality has actually gotten worse, according to a new report. More than 50 million Americans live in economically distressed communities, according to a startling new report from the nonprofitEconomic Innovation Group. The report, which examines economic distress across tens of thousands of ZIP codes, finds one-fifth them to be in economic distress. In the average distressed ZIP code, around 25 percent of adults lack a high school diploma, and a whopping 55 percent are not working. The report’s findings are based on a new Distressed Community Index, which maps community well-being in the U.S. down to the neighborhood level. It covers over 26,000 ZIP codes, 3,000 counties, and nearly 800 cities based on data from the U.S. Census Bureau. Areas are scored based on an equal weighting of seven variables, including poverty rates, housing vacancy, unemployment, and changes in the number of local businesses. Very few large U.S. cities have both high levels of prosperity and low levels of spatial inequality—meaning that advantage is generally concentrated in a select few areas. Just nine out of the nation’s 100 largest cities enjoy what might be termed inclusive prosperity, where the gains from economic growth are distributed broadly among residents. These are mainly smaller, more affluent places such Arlington, Chesapeake, and Virginia Beach, Virginia; Chandler, Gilbert, and Scottsdale, Arizona; Irvine, California; Madison, Wisconsin; and Plano, Texas. The table below shows the ten U.S. cities with the largest number of people living in distressed ZIP codes. Given its large population size, it’s no surprise that New York takes first place with over 1.3 million residents living in distressed ZIP codes, which is roughly 16 percent of its population. Chicago comes in second with over a million residents in distressed ZIP codes (39 percent of its population), followed by Houston with over 700,000 (33 percent of its population). The rest of the top ten consists of large metros like Detroit, Philadelphia, and L.A. 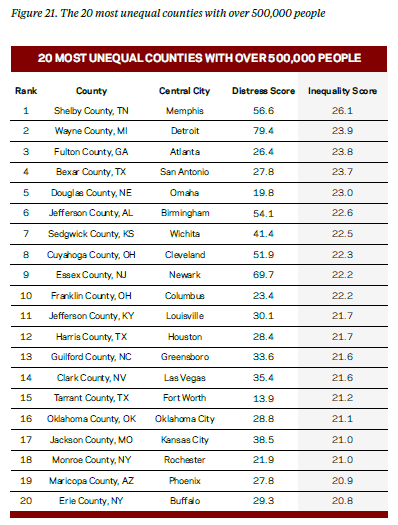 The table below identifies the top 10 most distressed cities in the nation. As one might expect, the report again finds that “struggling Rust Belt cities in the Northeast and Midwest register the highest levels of economic distress.” Camden, New Jersey, takes first place with a distress score of 100, followed closely by Cleveland, Ohio; Gary, Indiana; and Youngstown, Ohio. Hartford, Utica, and Harlingen, Texas, secure the next three spots, while cities like Albany, Flint, and Detroit round out the top ten. All 10 of these cities have a distress score above 98. The next table shows the top 20 most unequal counties in the U.S. This list mostly consists of Southern counties that include cities like Atlanta, Birmingham, Houston, and Fort Worth, as well as those in Rustbelt cities like Detroit, Cleveland, and Columbus, Ohio. Ultimately, this important report goes to show that the geography of inequality across the U.S., even in the midst of recovery, is extremely spiky and characterized by areas of concentrated advantage and disadvantage. While some communities have been able to recover nicely from the Great Recession, others are in fact worse off than before. When all is said and done, too many Americans live in distressed neighborhoods and too few cities combine growth with inclusive prosperity. With the local elections here, the merry go round starts again. No real change will come. More tax revenues sought with robot type jobs. More middle income folks leaving and certainly no entering Bibb. What to do? More fees on the locals and businesses. More school teachers told what and how to educate. More non-plannig. More take care of the outsider and developer. More live for the dollar. Damn the resident. Weclome to our county! I can remember when Brown and Williamson Tobacco was hiring like crazy back in 1995 and entry level pay was over $13.00 an hour. At that time there must have been over 1,200 people working three shifts. As a temporary worker and student, I could have been hired permanent but refused due to my abhorrence of a product which cause fires, litter, and cancer. Now look forward twenty years at what the industrial environment has become. WMAZ television did a segment on the new Kumo Tire today. Our technical school public relations people, the staff on the show, and various people and workers were saying what an honor it is to be jump starting the economy here once again. Today, $15.00 hour sounds wonderful. Producing five million tires a years sounds wonderful. Putting four hundred people to work sounds wonderful. But what really sounds wonderful to Macon leaders the most is the tax revenue. Not the workers, they will be brought in from Albany and surrounding towns. Five million tires produced from deforestation. No problem for our leaders. Low pay for the skills required to operate these machines which are much more complicated than any cigarette machine. Our leaders could care less, because it means more students will goes to school and get in more debt. But when the cars and trucks stop selling what will happen to the workers. Will they hang around Macon and become the new poverty class. Thinking back, working in the cancer causing business did have it’s positives. The industry did help reduce the population problem we have today. The pay, overtime, and retirement plan did help the workers survive after the layoffs. And the number of people employed and working and living in Macon did help the economy. The people leading Macon today in the schools, in the county offices, and in the multi-national corporations could care less about Macon or it residents. They worship the dollar. You, the resident, are secondary, so get use to it.